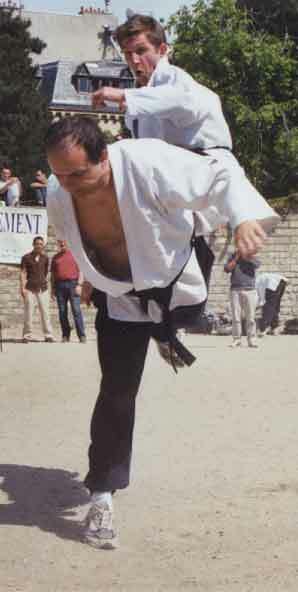 On right the winner photo : the spectacular «flying» attack of Henri de Montvallier (Shaolin Kung Fu school of Pavia, Italy, founded by master Chang Dsu Yao and currently directed by master Giuseppe Ghezzi, 7th dan) is blocked by Willy Jacq (3th classified at the World cup, JuJitsu Butokukai school of Paris) by a powerful ushiro geri (kick behind). The 4th WBI Ju-Jitstu World Cup was in fact opened to fighters of all styles of combat with naked hands. 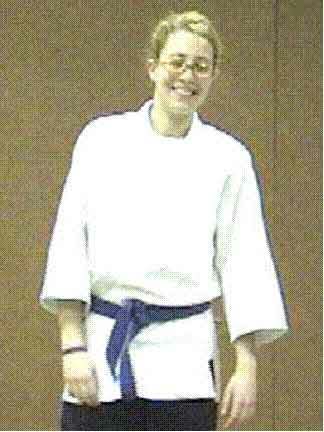 On the left : The author of the photo, Jennifer Bernier, brown belt of JuJitsu Butokukai school of Paris.